Lightly sweetened and whole grain, these cardamom infused Swedish cinnamon buns are a slightly healthier take on the American cinnamon bun. In a small saucepan over low heat, melt the butter. Stir in the milk and heat to between 120°F and 130°F (49-54°C). While the milk is heating up, mix together the yeast, sugar, cardamom, salt, white whole wheat flour, potato flour and vital wheat gluten in the bowl of a stand mixer. When the milk mixture has reached the correct temperature, pour it into the flour mixture and use a silicone spatula to stir it in until well combined. Mix the dough on low and gradually add the 1¼ cups of all-purpose flour. Let the flour be fully incorporated before adding more flour. The dough should still be a little sticky and won't completely pull away from the sides of the bowl. Add more all-purpose flour, if necessary, one tablespoon at a time. Knead on low for 10 minutes. Form a ball with the dough and place in a lightly oiled mixing bowl and cover the bowl with plastic wrap or a thin kitchen towel. Let the dough rise in a warm place until doubled, about one hour. Meanwhile, prepare the filling by mixing together all the ingredients in a small bowl. After the dough has doubled, punch the dough down, and knead a few times on a lightly floured clean surface. Roll the dough into a 10x12-inch rectangle, spread the filling evenly on top, and then carefully roll into a log. Use a piece of unscented dental floss to cut ¾" pieces. Try to keep the pieces the same size. Place the kanelbullar in baking cups or on two parchment lined baking sheets. Cover with a lightly greased piece of plastic wrap and let rise in a warm place until doubled, about 45 minutes. The last 10 minutes of rising, preheat the oven to 450°F (232°C). 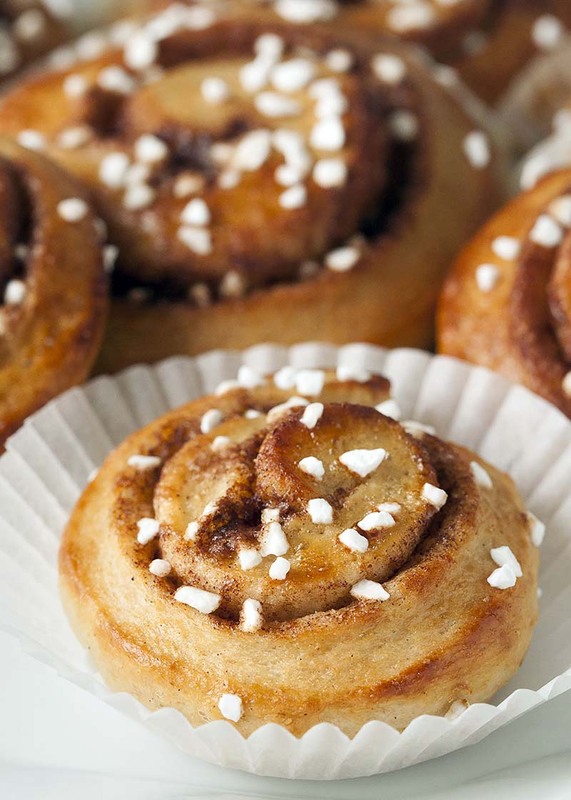 Once the kanelbullar have doubled in size, brush the egg over the buns and sprinkle the tops with pearl sugar. Bake on the middle rack for 6–9 minutes or until evenly browned. Keep a close eye on them after the first 6 minutes – they burn quickly! Remove from the oven and put in the second sheet of kanelbullar. Let the kanelbullar cool completely on the pan. Store in an airtight plastic bag for up to 3 days. Refrigerate or freeze after that. Recipe created by Texan Erin. If you don't have white whole wheat flour, please consider purchasing some for this recipe. These kanelbullar will come out harder and drier with regular whole wheat flour.